Software and Information Technology (IT) topped JobStreet's released annual salary report for the year 2015. Focusing on the profession instead of the industry, the annual report ventures to more ways to assists their job seeking customers. IT related work such as in database administration, system and network had consistently occupied the first two ranks of the list both in junior executive position (1-4 years experience) and supervisor position ( 5 or more years of experience). Other specializations included in top 10 are customer service, communication and electrical engineering, training and development, and sales/telesales. 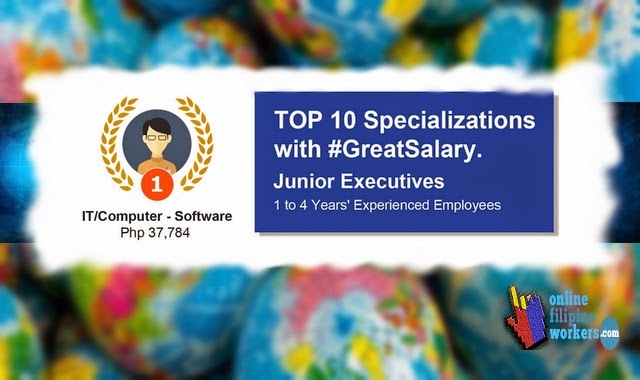 According to the report based on junior executive positions, the junior executive position in IT that specializes in software offers P37,784, ranking as the highest offered salary above other specializations in the country. The position of IT that specializes in network and database administration comes in second at P33,029. For supervisor level, IT job offers P67,000 while managerial level offers a little more than P100,000. In all levels, IT work is consistent on the first top 2. Customer service and training deveopment had also been consistent in top 10. On the other had, in managerial level, finance, architectural and manufacturing also got into top 10. Companies using the service of JobStreet are asked to include the salary offer accompanying the job position they are offering. In this way, JobStreet is able to inform jobseekers which job offers the best pay and compensation. Also, this gives the idea if you're company is giving you a competitive salary compared to others. Job seekers can also easily see if their chosen field right on track if they aim for better career posibilities.